Some of the greatest ideas in the world had their start in a science fair. From inspiring Nobel prize winners to become scientists, to actually unveiling groundbreaking new ideas, science fairs are no longer venues for mixing red-dye colored vinegar and baking soda, in a big pile of clay with a hole and calling it a volcano. Nowadays, there’s real science going on. More than not, science fairs of today are places for cutting edge science & engineering in the making, and brand new inventions. Not only do many science fair projects end up becoming published peer reviewed research or even doctoral theses, but it turns out that many ideas you find at science fairs are quite patentable. In fact, in recent years, students can receive patents as one of their awards. Massachusetts was at the forefront of this new phenomenon. What’s a patent? A patent is a way that countries allow for people with great ideas to have a time-limited exlusive right to commercialize or license that idea. It is effectively a government-condoned time-limited monopoly. It is meant as a legal reward for coming up with innovative new ideas, and for putting in the effort to do the scientific testing behind those ideas, to help society and/or the economy as a whole. Fish & Richardson is a patent law company in Boston with a formidable reputation and which has been in business for over a century. In fact, they did the original patents for Thomas Edison and Alexander Graham Bell. However, they recognize that not all the greatest ideas in the world come from geniuses, nor from adults. For the past 5 years, they have been collaborating with the MA State Science & Engineering Fair to offer a very special award to the top students, with the most patentable projects. The Fish & Richardson Patent Award is carefully selected by a team of experienced attorneys, who do their “judging” somewhat secretly in advance of the fair by reading through all the abstracts. Then, after pre-selecting a number of projects to explore further, they judge for real and in-person at our annual high school statewide science fair, held at MIT (a good reason to make sure you are at your project at all times during the entire judging hours, even if you’re finished with your regular judges). They select several projects which they deem original, unique and patentable and give out awards during the regular award ceremony, on a weighted scale based both on rank and “patentability”. The important thing to note about science & engineering fairs is that they are generally speaking, public events. So, if you have an unpatented idea, and you release it during a science fair, it can be “stolen” by just about anybody legitimately. It’s important to have proper patent protection in place when doing public events. A provisional patent (see the US patent process here: http://www.uspto.gov/patents/process/index.jsp) is a simple way to patent your idea easily with or without an attory for around $100 for a one year period, during which you can negotiate a license deal which may be able to pay the full filing fees (filing a real, long term patent can cost thousands to tens of thousands of dollars). It offers full protection, but you one get one year. Fish & Richardson’s patent award, however, is the full prosecution, using their world class attorneys, and can be valued on the upwards of $30K or even $40K. So, enter a patent competition today – or consider filing a provisional patent before your science fair. Not many young people do it — but it will win you big credentials if you do! Well, actually, it was Stephen Jay Gould, of Harvard University, and a colleague of his – Niles Eldredge of the AMNH in New York. But it’s commonly believed that a group of tiny Bermudian snails secretly whispered it into Gould’s ear one day (just kidding). You have a choice: see more about this theory in the vlog above by Barnas of THL/MisterScienceFair, or continue to read the blog below – or both. Punctuated equilibrium is a theory that says animals evolve rapidly in new environments. It’s similar to the work of Charles Darwin (and of course 1800′s British paleontologist Mary Anning, who did not receive much credit for her work, described in THL’s The Furious Case of the Fraudulent Fossil - link below), which states that animals will adapt to new conditions, based on random mutations. However, Stephen Jay Gould believed that it could occur in much faster spurts, in geologically speaking, very short periods of time. There were periods in time, when there were large numbers of species evolving, and they were generally times after something catastrophic or significant happened. That’s why you can find 15 species of Bermuda land snail fossils in a relatively short geological timeframe of only a few hundred thousand years. Back when Dr. Gould was a young student in the late 1950′s, he was a deckhand for the Woods Hole Oceanographic Institute, based in Massachusetts, which ended up taking him on a research trip to Bermuda. He had already done some studies on Gastropods (snails and related creatures), and noticed various living and fossilized snails while he was there. It turned out at that time there was a single very abundant species of snail, Poecilozontes bermudensis, which could be found all over the island (there were also other species too, including P. nelsoni and P. renianus). This snail was so ubiquitous, that the they were sometimes collected and burned just for their lime (CaC03). Well, it turned out that the government felt these snails were too common and may affect crops, so several predatory species of snails were introduced to the island, as well as an edible species. Within just 2 decades, the Bermuda land snail was nearly wiped out, and the new species dominated. Currently, it is believed that three species of snails have gone completely extinct, and only one remains, Poecilozontes circumfirmatus, which is now an endangered species, and may also be extinct soon. However, based on fossil evidence, this group of animals has likely been on the island for hundreds of thousands of years, very well adapted and relatively stable until the last century. Only man has been the greatest factor in its extinction, by importing new species, both intentionally and accidentally. The amazing thing is that all these snails which evolved there were thought to have been introduced to the island by only 1 or 2 animals clinging to a log or some other floating debris, part way across the Atlantic ocean. Bermuda is so far from mainland North America (2 hours plane right from most places in New England) and in relatively cold water, that it’s quite remarkable to imagine these tiny animals could have survived the journey and filled the entire island with their progeny. For Stephen Jay Gould at the time, this was a fascinating topic, and he decided to use it for his Ph.D. thesis (not to mention, Bermuda’s not a bad place to do some fully funded graduate science research). Later, this idea “evolved” into a theory known as Punctuated Equilibrium, which was the subject of a number of books written by both Gould and Eldredge. Despite some opposition, this theory is widely recognized for its various merits and is accepted by many in the paleontology and general biology communities. Stephen Jay Gould remained the Curator of Invertebrate Paleontology at Harvard University’s Museum of Comparative Zoology for many years, and I had the pleasure to speak with him on various occasions, when I worked there during college (although I was working in the vertebrate, not invertebrate department). It was a great honor to work with an amazing thinker, and to all young readers out there, I encourage you to cherish your time with your mentors, because you never know when it may end. Interestingly enough, I have recently discovered that land snails were also a favorite topic of my great great grandfather, Olof P. Nylander. Olof was Swedish immigrant, who became a well known naturalist in Northern Maine, and later founded the Nylander Museum in Caribou, Maine, which is still in existence today. In fact, he also studied and had a group of land snails named after him — the Vertigo nylanderis. New species are still discovered all the time, and old species once thought extinct can sometimes pop up where you least expect it. It is thought that one extinct group of Bermuda Land Snails may have been recently found, though it’s not verified yet. So, be sure to get out there and look on the ground, in the plants, and keep exploring – there is a possibility you can make another big find, or have a species named after you too. If you find evolution mysteries interesting, like I do, please read my recently released book: The Furious Case of the Fraudulent Fossil. A few months back there was a report that the world’s largest dinosaur eggs had been discovered in Chechnya (do a google search for “world’s largest dinosaur eggs” or something like that and you’ll see links everywhere). It made it to worldwide news within days, and was even reported on ABC News. Chechen officials were ecstatic that there may be a surge in tourism and revenue to their local economy. 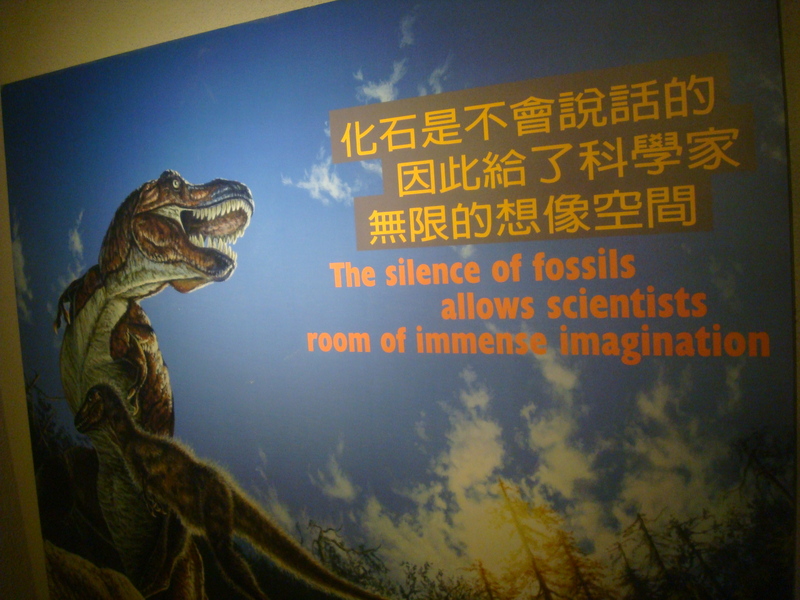 In fact a number of dinosaur enthusiasts, mostly local, did try to visit the site in coming days and weeks. Around the same time a report came out from the University of Zurich (Dr. Marcus Clauss, and others) that one of the major reasons for large dinosaur extinction was the fact that dinosaurs had to lay eggs. Although dinosaurs kept getting bigger (for instance the Titanosaurs which are well known from fossils in Argentina, and thought to be some of the largest animals that ever lived — there were several dozen species, some of which could have weighed up to 100 tons), their eggs were getting comparatively smaller. An average Titanosaur’s eggs were only about a foot in diameter. So, the babies inside would have only weighed a few kilograms — a far cry from the at least 50 tons they were expected to grow to, as an adult. Eggs are designed this way in part because there are physical limitations to airflow through a membrane, which means that in order for the egg to retain its strength it had to remain small enough for oxygen to get inside, and carbon dioxide to get out. It is theorized that because the babies of the large dinosaurs had to occupy such a widespread niche in the dinosaur’s ecosystem, there were comparatively fewer small dinosaur species around, which could have survived a massive extinction event. Furthermore, as babies the dinosaurs would have largely fended for themselves, whereas mammals, and smaller birdlike dinosaurs were more involved in the raising of their young. This meant the large dinosaurs were more likely to die off in a catastrophe with a food shortage. The largest dinosaur eggs ever discovered were found in China in the 1990′s, and were 2 feet (60cm) long, and around 20 cm in diameter. Much smaller than 63cm to 1 m, which was the originally reported size of the “eggs” found in Chechnya. Considering that the largest vertebrates which ever existed had eggs about a third of this size, you’d have to wonder how big the animal was, that laid these huge eggs. Having studied dinosaur eggshells for a number of years, when you hear something completely astonishing like this, you have to regard it with a careful scientific eye, if not outright skepticism. The claim that the eggs had widely varying diameters, and the “yolks” and “whites” clearly visible were a key indicator that the eggs may not be real. Dinosaur eggs are rarely discovered intact, and moreover, they rarely have consistent, clearly divided sections, and are without lots of eggshell evidence around. As a young budding paleontologist, in my middle school years, I had the opportunity to study at “Egg Mountain” – the first dinosaur egg nesting site in North America made famous by Montana’s Dr. Jack Horner. I recall that for every partial egg you found, you’d see tons of eggshells along the way leading up to it, which were so plentiful, and so scattered, you wouldn’t even bother to collect them. Like modern chicken eggs, dinosaur eggs would have been relatively speaking, fragile, and could shatter, and as dry eggshells, spread easily all over the ground. Part of the reason that eggs and eggshells are so complicated is because they have to serve a bunch of different purposes. They have to 1) protect the embryo from the environment and predators somewhat, like armor, 2) protect the embryo from toxins, 3) allow the baby to breath, 4) be able to be broken by the baby when it’s time to hatch. There are a number of other purposes too, but these are really the main ones. Eggshells are made up of a mixture of both organic (protein-based) materials and inorganic (calcium carbonate usually, and sometimes calcium phosphate, like bones) materials. The eggs contain an inner lining of a membrane which helps keep bacteria and other toxins away from the whites and yolk, and pores which allow for gas exchange. It is this membrane that serves as a growing point for the fibers and calcium carbonate crystals which act as the “skeleton of the egg”. Below is a picture of a modern eggshell which I took with an SEM for comparative purposes, when I worked at Harvard’s OEB lab, trying to determine if an egg-like fossil from the Triassic was really a membrane based egg. Now that was a tough project, and still has no firm conclusion. So, when you look at the initial pictures of the eggs from Chechnya, you see something quite interesting. You see concentric circles around some of the eggs, which is pretty inconsistent with the growth patterns of normal eggs, which grow from the membrane out, and not as large, single spherical shells from one end to the other. They look a lot more like the concretions or “bowling balls” like the ones here on bowling ball beach in California (a real place). From philwendt.com, a picture of concretions from CA – note that the rock in the left center appears to look a bit like a cut hard boiled egg, due to various mineral stains., but alas, it’s just a rock – not a fossil egg. It wasn’t even days after the ABC report came out that scientists came forward with publicly expressed doubts. A month later, a Russian university report came out which finally declared that the “eggs” were nothing more than rocks. In more recent months, people with access to the specimens have confirmed that these “eggs” were indeed nothing more than concretions and should have been checked more thoroughly before an announcement was made. Even more recently articles have been published that a set of small meat-eating (Theropods, like Velociraptor) dinosaur eggs was found that resemble the morphology (shape) of modern bird eggs, in that they are oval and elongated. This suggests that just maybe, the small meat eating dinosaurs may just have evolved into birds in the nick of time, and became the very birds we see today. A paleontologist Nievez Martinez, who passed away over a year ago, discovered this group of ovoid eggs, and was able to do research on this amazing discovery before her untimely passing away. More on her research can be found here: http://www.sciencedaily.com/releases/2012/07/120712092443.htm. In fact, there are more recent scientific studies as of this week (http://www.sciencedaily.com/releases/2012/10/121011141443.htm) that add further evidence to suggest Steven Jay Gould may just have been right that vertebrate evolution occurs in short, necessary bursts, based on a basic genetic developmental toolkit which has existed for hundreds of millions of years (published a few days ago in Science). The differences between a very light hollow-boned hunting dinosaur with feathers and a very light hollow-boned bird with feathers and wings is really very very small, given the huge variety in species today. It’s still possible that some of the birds you see flying around today, are distant cousins of T-rex, or at least maybe Deinonychus or Velociraptor. One can only wonder and hope. There’s No Such Thing as Triceratops! So Many Dinosaur Species… Or Were There? As I was walking through the Dawn of the Dinosaurs exhibit in Taipei’s Chiang Kai Shek Memorial Hall the other day (which I highly recommend, although the exhibit is about to leave the country this week and go somewhere else in the world), I noticed that there were walls and walls of dinosaur species lists. The exhibit was overflowing with information about “brand new” dinosaur species. It got me to thinking — growing up, there were maybe a dozen really important dinosaur species you just had to know. Then in my teens, entering international science fairs about dinosaur evolution, where I had to be up on my “dinosaur terminology,” I recall I probably knew maybe a hundred (I know, this is not terribly normal, really, but for a fan of dinosaurs, not too abnormal I assure you). Now it seems to me there are thousands — many quite obscure and closely related to other known species, and identified only from a few fragments of bone. And the list keeps growing all the time. Perusing the halls of one of Taiwan’s most important architectural icons, I couldn’t help but think how cool it was that it was full of iridescent skulls from “never before displayed” dinosaur, reptile and mammal fossil species. Well, it turns out that some, if not many of them, may not have ever existed. During the early part of the last century, after the “gold rush” of the prior centure, there was another geological scramble to hit popular society, and that was the “dinosaur rush”. P.T. Barnum, in the late 1800′s instilled a sense of showmanship into American culture that has not been matched since. During that same time period, O.C. Marsh and E.D. Cope, the famed “giant dino” hunters, and many other amateur paleontologisits, found dozens of new species every year in fossil sites throughout North America. They would name species left and right in a mad rush to claim newspaper headlines that such and such museum would be showing a new species of dinosaur. there were countless dinosaurs discovered, by the largest museums and zoological centers in the world, seeking to attract new visitors. According to Dr. Jack Horner, of the University of Montana, prominently featured in my new book ” The Furious Case of the Fraudulent Fossil,” there are a number of species of dinosaurs that never truly existed (and not just Triceratops, but also a type of Tyrannosaur known as Nanotyrannus, among many others). That is, according to the rules of scientific naming rights, they should not exist as new species. This is very similar to the way that engineering recognizes patents, which are issued on a first come, first served basis. If you file your patent first, you get the right to a technology and can own a localized monopoly that can last for decades, which could make you billions of dollars. In the world of academia, if you find a bone which you think represents a new species and publish first, you get the right to be able to name your species and keep that name forever. Individual paleontologists, academic instititions and museums all love this system, because it gives them permanent bragging rights on their respective resumes and brochures. It turns out that many species in paleontological history may have been named withourt proper due scientific diligence. Well, as Horner put it at the beginning of his TED talk, 3-to-12 year old children (a good part of Tumblehome Learning’s target audience) may be shocked to hear this fact but sadly, according to the rules of science, the Triceratops did not exist! However, it’s doubtful that childrens’ book publishers and toy companies will do anything about this new fact anytime soon, as the word Triceratops is now so well embedded into our common culture. It’s unknown just how many dinosaurs at this point may have been incorrectly named or renamed, and there are indeed a number of people who believe that Horner’s hypothesis is not correct. However, it does point to the fact that science is constantly evolving, and scientific facts which have been widely accepted for over a century, can still be wrong. Despite the possibility that there are fewer dinosaur species out there than previously thought, new species are still found every year. So, get a copy of ‘Fraudulent Fossil’ or our FF companion kit, and start digging today! Well, we didn’t really land on Mars, but the $2.5B Curiosity unmanned rover recently did – on August 6, 2012, and THL was on site in Florida when the vehicle came online. The featured image is actually a digital postcard of me just outside the NASA Kennedy Space Center’s “Mars Room”, where a computer digitally merged a webcam photo of my face into the image of what a future NASA astronaut may look like, on the surface of Mars. 2012 marks the 50′th anniversary of the space center, in addition to being the last year of the US Space Shuttle program, which is regarded by many to be the greatest US achievement in space technology, aside from landing on the moon. The shuttle program was designed to be an economical way to reuse most of the parts of the launch vehicle while at the same time being able to carry more payload and more passengers safely. See here a cool NASA moving space shuttle model, that is around 3 or 4 feet tall (talk about an awesome idea for a Lego Mindstorm project). Future launch vehicles will likely return to the older typical rocket form factor, and will be operated commercially, with government support. THL was on-site at the USSEF in Washington DC to see one of the first future rocket designs, the Orion, produced by Lockheed Martin (see below a pic from our blog at the USSEF). While man has not yet ever actually landed on Mars, the US has sent a number of rovers to explore the surface of Mars. NASA recently sent a brand new robotic land rover, named Curiosity, which traveled over 354 million miles, smacking into Mars at over 13,000 mph (taking 8.5 months of travel), which offers some of the highest resolution imaging of the surface of Mars, in a vehicle that is stronger, with longer lasting batteries and more powerful sensing instruments than its various predecessors (2 others in recent history, see below). NASA, an organization which strongly supports STEM education about current technology, has already installed an exhibit about Curiosity at the Kennedy Space Center education hall, within one day of landing. In recent days, there has been a buzz in the news about some photographs taken by the Mars Rover, which happened to capture Curiosity’s crash landing in the distance. It is incredibly difficult to land a space vehicle in a very precise region, when you’re traveling unmanned at speeds that are many times the speed of sound, let alone on another planet with a 14 minute communication delay. Below is a JPL-animated video of the launch and landing of the Curiosity. The Mars Curiosity Rover, part of the Mars Science Laboratory, is the largest rover sent to Mars, nearly twice as big as previous rovers. It’s mission is to study the geology and biochemistry of Mars’ surface, with the intent of determining it’s “habitality” or livability for future manned space missions. THL’s Daedalus Graphic Novel Series, in partnership with FutureDude Comics, is “real science fiction” about interplanetary travel in the not-too-distant future within the solar system. It was written and designed by a former engineer from NASA, Jeffrey Morris, based on real scientific information. The predecessor to the Daedalus series, Slingshot, contains an endorsement and foreword by one of America’s most famous astronauts , Buzz Aldrin, who was on the first mission to the moon, and walked on the moon’s surface with Neil Armstrong. THL’s Venus: Daedalus One is the first in the series and is already available via our online store. The next book in the series, THL’s Mars: Daedalus Two, which as the name implies is about mankind’s upcoming mission to land on and temporarily colonize Mars, is expected to come out in early 2013. * Note that most pictures in the above blog were taken at the NASA Kennedy Space Center in Florida, and contain images of simulations or real vehicles that are the property of NASA. As I was hiking up one of the tallest mountains in Taipei the other day, I came across an exposure of sedimentary rocks that appeared to be somewhat recent, and with very clear marks that looked like fossils. As I looked closer, I saw some markings that looked a lot like plants. I had heard that this particular region had a number of really well preserved plant fossils – and these looked just like ones I had seen online (click on the pic to enlarge it). Well, it turns out after I poked at it a bit, a piece of it lifted up. After a few kicks, the plant fossil scratched away entirely. It turns out it was a really flattened modern plant that has gotten somewhat muddy and adhered itself to a really flat piece of mudstone. It turns out these weren’t seashells that were pushed up from a beach a few hundred feet away, after some big storm. But in fact, they were real fossils, that had been preserved in sandstone since the Miocene, perhaps sometime between 10 and 20 million years ago. Here you can see a video of some of the fossils from this particular locality (and the nearby rock wall, while it may look like a sandy dune near a beach, I assure you, is as hard as cement). It goes to show that you can find “fraudulent fossils” anywhere (stay tuned for the upcoming release of my new Galactic Academy of Science series book “The Furious Case of the Fraudulent Fossil”), and can sometimes be fooled by some really well preserved fossils in special localities into thinking that they are merely modern (extant) remains. In my book, I mention one case of accused fossil fraud in the 1700’s, but I was inspired to look more into other fraudulent fossils over time. It is thought that Chinese have believed in dragon mythology for thousands of years, with the earliest depictions being in Neolithic caves in Asia between 5,000 and 6,000 B.C.. It has long been thought that the bones of petrified dragons could be found throughout China, although these have all since that time been identified as fossilized dinosaur bones or other types of more recent fossils, including reptiles, birds, mammals and even humans. These “dragon bones” were thought have special curing powers and were commonly sold by ancient “pharmacies” to heal illnesses. One such case of early human and mammal bones being sold as dragon bones was just outside of Peking, which is now known as modern day Beijing, the capital of China. Peking Man (homo erectus pekinensis) was a very early human ancestor who lived around 700,000 years ago, and was discovered in the 1920’s in a locality known as “Dragon Bone Hill”, named because it was a quarry from which these fraudulent medical dragon bones were regularly extracted. A Swedish-American team first identified the possible human ancestors from teeth that they found in this hill – these fossils otherwise may have ended up as medicine. Originally, early hominid bones were thought to be merely misformed apes (such a Eugene Dubois’ discovery of Homo erectus in 1891), but it wasn’t long before the study of early human ancestors picked up. 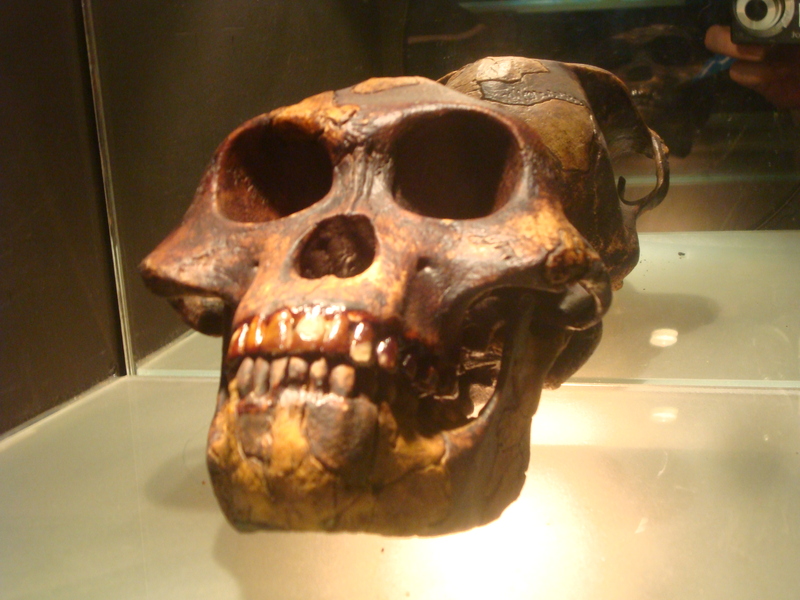 Peking Man also faced further controversy later on when its bones were stolen during one of the World Wars, never to be found again. These “dragon bones” weren’t necessarily malicisously replicated or altered fossils, but they were purposely misidentified and as such I decided to thrown them in as “fraudulent fossils”. Since the 6th Century BC, Romans have loved fossils and had adorned their palaces and places of worship with various types of invertebrate and vertebrate fossils (the Temple of Juno bore woolly mammoth tusks). 3,000+ years ago, teeth of large extinct great-white sharks called Carcharadon were found at sacred sites throughout Italy and Greece. Not to mention, these fossil teeth were also regarded as a form of medicine throughout Europe too. They were commonly faked with extant bones and bones of other extinct animals, and as such, laws were even passed to prevent selling fake fossils. Gastropods and other sea fossils were replicated in large quantities – baked in clay ovens and used in religious rituals throughout Roman times. Some of these fakes were even discovered in Minoan remains in Crete – some of the earliest examples of faked fossils. It’s sad to say, but we at THL have been accused of creating our own fraudulent fossils based on Moroccan trilobites. Here is a picture of a Morrocan trilobite, at the Taiwan National History Museum; it is very similar to the ones we have used for internal team building exercises at THL (pic below – compare to the THL Facebook page: http://www.facebook.com/tumblehome.learning). This is a highly debated and controversial discovery of the first cheetah in history, from China. It is estimated to be 2.5 to 2 million years old – an “Old World” cheetah. It was described in 2008 and then published a year later in a paper in the well known publication PNAS, but since then has been criticized publicly by a variety of experts in China who have seen the fossil and believe that it was faked. Deng Tao, from the Institute for Vertebrate Paleontology and Paleoanthropology in China, noted that parts of the skull were created from plaster, and are missing part of the parietal crests. Qiu Zhanxiang, a global expert in mammalian craniums, has also conferred that the skull of the cheetah appears to have been forged. However, as of now, the skull is still not permitted for view by outside researchers, and little data is allowed to be released on the matter. Although it’s not a very popularly known hoax, it is among the worst kinds of fraudulent fossil, as it has received widespread global media attention but yet, is still unresolved. In 1912, Sussex England, the remains of an early human ancestor were found in a gravel pit and named Eanthropus dawsoni, after the man who discovered it – Charles Dawson. Dawson claimed to have spent 5 years collecting parts of the specimen in a gravel quarry, after first receiving a fragment from a worker. After revealing the skull to prominent scientists, including those at the Royal Geological Society of London, it turned out that there were a number of scientists who believed that this fossil was the “missing link” between apes and humans and just so happened to be in the UK, which was a major center for paleontological science at the time. It took several decades before geological research and fluorine chemistry tests (1949) determined that Piltdown was a hoax. However as early as the 1910’s, there were scientists in Europe who believed it was nothing more than a combination of fossilized ape and human parts put together. It turned out to be predominantly fragmented ape skull bones, along with several human molars. The identity of the forger was never found, but it was clear that it was either Dawson or someone close to him. The forgery was officially declared in 1953. Given the widespread promotion of the find as the “first Englishman” for decades, it has also been regarded as a key example of the problems in science and a symbol of Western arrogance. So, why do people make fraudulent fossils? Well, there are many incentives. For some people, who are under pressure to perform within the scientific community, it’s all about publish or perish. Sometimes, you need a discovery “or else” – and out of desperation, some scientists resort to unethical behavior. Sometimes, people, especially amateur enthusiasts, are looking for attention and want to create a hoax to gain attention. In some cases, reputable scientists have been duped because they have not ever experienced a hoax before, and are eager to promote a new discovery. In some cases, fossil thieves/poachers merely want a little extra money, so they “enhance” their fossils a bit without realizing the ramifications of their actions – that they might be fooling people who are in the real world of science. However, by far the biggest incentive to create “fraudulent fossils” is money. Fossil sales can be big business. As we have learned time and time again, in the news, you can make pretty big bucks with very large and popular fossils, as well as extremely rare and important fossils. However, like anything else, where collection results in harm (endangered species artifacts, anything from rain forests, oceanic or archaeological/cultural relics, etc..), it is advised not to collect rare fossils as it not only hurts science, but may also hurt people, animals and the environment too. The “ring of fire” has a lot more meaning than the popular 1963 song by Johnny Cash, repopularized by the 2005 movie, “Walk the Line”. That’s what scientists are calling this latest full solar eclipse. It is a full annular (ring) eclipse of the sun, that only happens every few decades or so — depending on where you live. The hydrogen based fire of the sun is eclipsed by the shadow of the moon revolving around the Earth, such that the moon appears to be a small dark shadow with a slightly smaller diameter than the bright, radioactive sun. This most recent eclipse happens to have “peaked” both in certain parts of Asia and certain parts of the US, separated by 12 hours or more of time zone. It resembled a “ring of fire” because it looked just like the sun was a burning ring of fire, with a moon in the middle of it. The moon revolves around the Earth such that it has a full rotation to the same point around Earth around every 27.3 days (a sidereal month), in large part because it is 385,000 km away from the center of the Earth. So, it doesn’t move as fast as the Earth can turn around one full axis (24 hrs). Furthermore, the sun pulls at the moon with over twice the strength of the Earth. So, the moon’s orbit around the Earth changes all the time, and as such, given all the different variables it can be very difficult to determine when a solar eclipse will occur. At THL Asia, based in Taipei, despite relatively rainy and stormy weather, we were able to see the solar eclipse at around 6:46 AM, which was slightly after its supposed peak. However, our view of the eclipse was not quite the same as south of us – in Vietnam or Southern Fujian Province (where the author of this blog normally lives these days); we had only a partial solar eclipse, in between the clouds due to lots of increased year over year rain activity. According to most doctors and scientists, you should not look into the sun directly, eclipse or not, because it is harmful to the eyes. So, we at THL Asia used 3 different types of filtration methods to see the solar eclipse and document its progress along its pathway, which lasted a total of 1.5-2 hours. An unfiltered view of the “ring of fire” — NOTE IF YOU LOOK AT AN ECLIPSE DIRECTLY, YOU WON”T SEE ANYTHING AND YOU MIGHT GO BLIND! The first method we tried was the pinhole method, in which you poke a 1mm diameter hole in a piece of cardboard (either solid thin cardboard like you find in the back of calendars or cereal/packaging boxes, or even corrugated cardboard, if you are careful), and shine it on a piece of white paper from a few inches away. Generally this 1mm thickness is the thickness of a ballpoint pen tip, but can be plus or minus. View of the pinhole cardboard against a white piece of paper underneath — held 7-9 in apart; pictures taken from different angles will show different sizes/proportions of circles/ellipses. The second method we tried was reflecting the sun from a high clarity mirror to a white wall, through the pinholes on the same piece of cardboard. Multiple pinholes were made, of various diameters, ranging from needles to pen-tip-holes, to holes as large as the diameter as a regular # 2 pencil. You can see that the different diameters resulted in different sized reflections. Try to establish a good, bright reflection using different depths, ranging from 1inch to 1 foot away from the surface of the mirror, and reflect the light up to 6 feet away, with direct sunlight, so you can see where the position of the eclipse is. The last method we tried was when the sun died out a bit — and it turned out the be the best. When the sun is completely behind a cloud and there is no direct sunglight you can use dual polarized glasses and try to look at the sun directly for a second. Or, preferable, to avoid permanent damage to your eyes, you can take dual polarized sunglasses and angle them against a digital camera to find the appropriate angle to look at the sun. Make sure to only look at the sun through the digital display (LCD/LED display) so that you don’t hurt your eyesight. Although that method was a bit tricky , we got some of the best results! Try these different method, or use a professional filter or binoculars/telescopes or magnifying glasses, which are applied to a piece of white paper from several inches away. This can be tricky though. The methods described above are quite easy and can be figured out in a matter of minutes. Try them all, if you have time (like a 2 hour solar eclipse window) and see what you can achieve too!! Again this is only for solar eclipses — if there is a lunar eclipse, you can try another techniques, which are much easier than a solar eclipse– check out this NASA site here, and click around to find additional lunar eclipses in the future: NASA eclipse link . Here you see the cardboard with various-diameter pinholes, along with the flat mirror, and the polarized sunglasses used by Barnas Monteith when viewing the eclipse above the mountains in Houshanpi, Taipei, Taiwan. Michael Erb, a scientist from Rutgers University, who is specifically focused on studying the orbit of the Earth around the sun and how it affects long term climate change, is a THL featured first time author. His recent book “Kelvin McCloud and the Seaside Storm” is about weather/meteorology science and how it can be used to solve science/CSI mysteriies — it can be purchased at our online THL store: http://tumblehomelearning.com/shop . 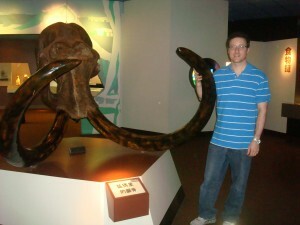 Have you been eating your mammoth bones lately? Leading up to THL’s first Chinese language science learning book releases in Asia at the Taipei International Book Expo, as well as the opening of our new office on ZhongXiao E (Dong Lu), Houshanpi, Taipei, THL staff have been busy at work on preparations in Taiwan, throughout the New Year. 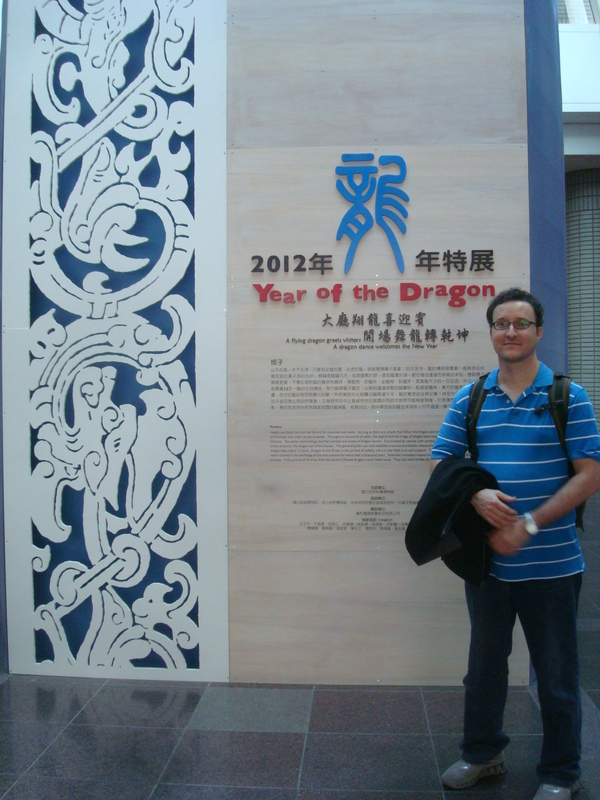 2012 – the year of the Dragon (龍) – is significant for Tumblehome Learning, as ‘fraudulent dragon fossils’ are a key theme in several of the inaugural books produced by THL this year, including the Furious Case of the Fraudulent Fossil, and Dinosaur Eggs & Blue Ribbons, both authored by Barnas Monteith. Dinosaur, in English, originally named by Sir Richard Owen (1804-1892), is derived from the Greek words deino, meaning “fearfully great” and sauros meaning “lizard”; however in the most widely spoken language in Asia, Mandarin Chinese, the word Dinosaur is translated as “kong lung” (恐龍), which means “fearful dragon”. Dragons and dinosaurs have long been closely affiliated in Asian cultures in more ways than just their names; for hundreds of years, dinosaur and other vertebrate animal fossils, often darkly colored, were thought to be the charred and hardened stone bones of long-dead mythical dragons. As such, they were thought to have mystical healing properties and were revered by doctors and people with severe illnesses, not knowing that they were actually fossils of dinosaurs, reptiles, amphibians and even birds from millions, even hundreds of millions of years ago (this is even document in ancient text such as the Shennong Bencao Jing, ca. 100 AD). These “fraudulent dragon bones” were often crushed into powder and prepared in teas, and mixed into foods, in an attempt to use the magic of the dragon bones to heal the wounded and sick. Needless to say there were very few people truly healed by these dragon bones, but yet, even to this day the practice of using dinosaur bones in Eastern medicine still continues. It is a lesser known story that the origin of mankind, and the study of human evolution, was first discovered in a pile of these so called “dragon bones”. Peking Man (Sinanthropus pekinesis, named afterBeijing, once known as Peking), is known to be an early ancestor of homo sapiens (man). In the late 1800’s, many paleontologists, rather than going out and digging in the field, would instead visit Chinese pharmacies, knowing that some of the best finds could be had in the dragon medicines. German physician, Dr. KA Haberer picked up a number of fossils on a trip to a Beijing pharmacy in 1899, and unbeknownst to him, also picked up a 2 million year human-like molar, which it was later determined was that of the Peking Man, a very early ape-like ancestor of man — and additional parts were later found on subsequent expeditions to a limestone quarry location just south of Beijing known as “Chou Kou Tien” or “Dragon Bone Hill”. Important fossils continue to be found to this day, in remote apothecaries throughout Asia. 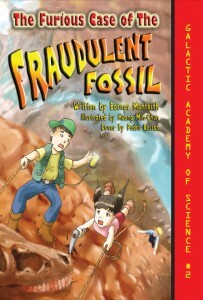 In Fraudent Fossil, students learn of a modern day fraudulent fossil mystery, which they must solve by going back in time to visit and learn from historically significant geologists, naturalists and other scientists who helped to shape the ideas which have evolved into modern paleontology. One such scientist/naturalist was Shen Kuo (沈括, 1031-1095) a high ranking Song Dynasty statesman who discovered the concepts of geomorphology and stratigraphy, while viewing the bamboo-like plant fossils found in different rock layers of the Taihang Mountains in Wenzhou, China. Shen’s idea of how rocks and mountains were formed predated the concepts of sedimentology and rock formation described by James Hutton in 1802, which has often been referred to as the work which defined modern geology. Geomorphology (the study of the shapes of landscapes and land formations) and sedimentary deposition / stratigraphy (how smaller rocks such as mud particles are joined together to make larger solid rocks like mudstone and slate over time, and then form layers) are perhaps the most crucial tools used by geologists & paleontologists to utilize in studies of evolution (e.g. dating fossils to determine whether or not they are truly “missing links” – not to mention their validity as real fossils). Students also explore the world of Roy Chapman Andrews – an adventuresome American paleontologist and explorer often referred to as the real world basis for the movie character “Indiana Jones”. Roy Chapman Andrews (1884-1960) also visited China to hold expeditions in the Gobi Desert of Montana to try to find more clues about the history of early mankind, and to find evidence of missing links even earlier than “Peking Man”. However, instead, Roy Chapman Andrews became the very first paleontologist to uncover dinosaur eggs, and to describe in significant detail some of the behavioral characteristics of dinosaurs which could be inferred from fossils. 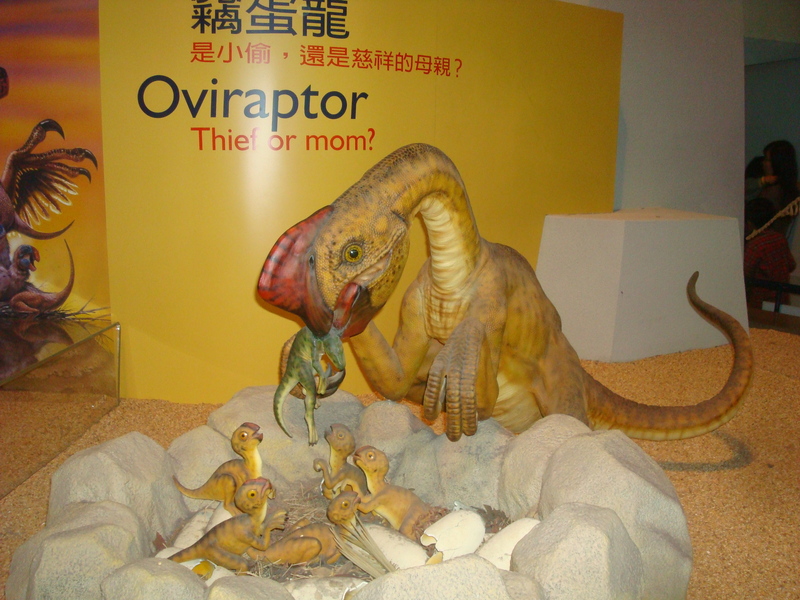 Reconstruction of a Gobi Desert, Mongolia oviraptor nesting site, exhibiting parental behavior. Roy Chapman Andrews aka "Indiana Jones" uncovered numerous nesting sites throughout the Gobi of China on behalf of the American Museum of Natural History, and had several species names after him. In Dinosaur Eggs & Blue Ribbons, Barnas Monteith digs deep into the world of modern paleobiology and the various advanced biochemistry techniques used today to uncover and compare ancient proteins, while offering tips and advice about how to succeed at winning science fairs. In the story, Barnas discusses his adventures as a young student of paleontology doing field research for his science fair project in the badlands ofMontana, under the guidance of famed paleontologist Jack Horner, a MacArthur Genius award winner, and the model behind the lead character inJurassicPark. Jack Horner’s work on dinosaur egg placement suggesting material nesting behaviors in Maiasaurs over60 m.y.a. were cutting edge in the1970’s and80’s, and Dr. Horner has continued to innovate new fields of paleontology. A number of years ago, Jack led a team of researchers to uncover proteins from a highly well preserved T-rex bone, which was so well fossilized, that some organic materials and possibly even cells of T-rex blood, actually remained within the bone. 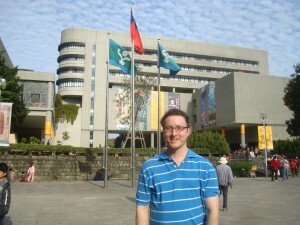 In recent years, Jack has been doing significantly more fieldwork in Asia, where a plethora of bird fossils and new nesting grounds continue to be found on a frequent basis; as a result of all this new data, Jack has come up with various new theories and ideas to support the idea that dinosaurs were incredibly bird-like and that dinosaur-like reptiles very likely evolved into birds. One of Dr. Horner’s ideas involves the concept of genetically “reverse engineering” dinosaurs from chicken DNA; so far, he has already been able to get a normal chicken to grow a small dinosaur-like tail by simply awakening old “extinct” genes. And he is not the only one working to revive extinct DNA – it was announced in 2011 that Japanese scientists have begun work on resurrecting 8,000 year old Woolly Mammoths, and expect work to be completed within 4 to 5 years. Scientists hope to revive DNA from intact If research advances as predicted, it may be possible to have a real woolly mammoth walk into the Smithsonian Museum of Natural History in Washington D.C. before the 2017 U.S. Presidential inauguration (for those of you who haven’t been there before, there is a giant woolly mammoth centerpiece which greets you, as you enter the lobby of the museum; museums are among the best ways to get children interested in science by the way, as can be seen in the most recent previous THL blog – by THL cofounder Penny Noyce). Taiwan’s own Taichung Museum of Natural Science, one of the largest and most well attended museums in the country, is home to an amazing collection of fossil elephants, mammoths, rhinoceros, and other mammals found throughoutTaiwan. 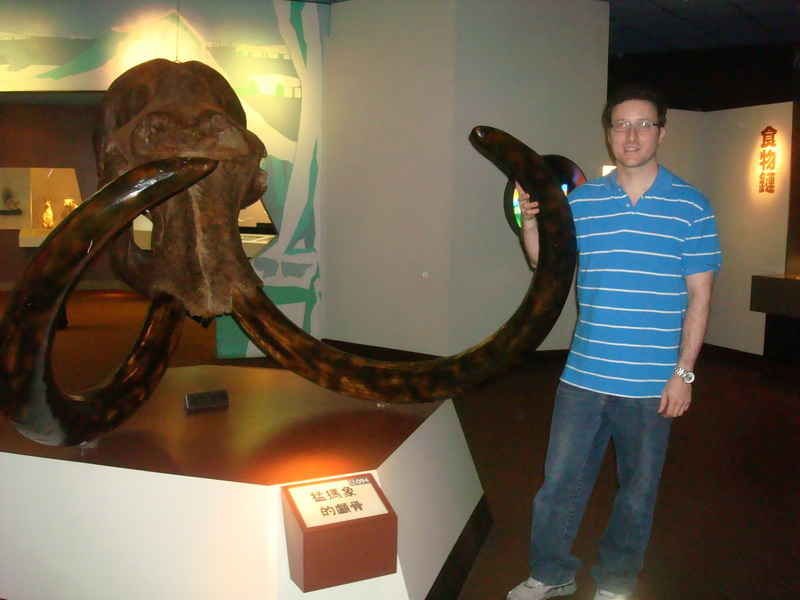 The Taichung MNS held a special mammoth exhibit in 2009, to display elephant and mammoth finds fromTaiwan, as well as from around the world, includingSiberia. Although Taiwan’s climate does not permit permafrost in most areas and therefore can not offer a good preservation environment for genetic material, the mammal fossils in TW are very well preserved, and have been described as early as the1920’s by Japanese paleontologists, as being related to other fossils found in mainland China, as well as in Japan. Most of these animals are from the recent Ice Ages,10’s of thousands of years ago. A recent study by scientists at a traditional medicine center in Oregon have determined that a variety of randomly sampled “Chinese medicines” are in fact fossils of elephants, woolly mammoths (Stegodon) and rhinoceros – very similar to the profile of fossils found in Taiwan. Who knows how many mammoths have been mistakenly consumed as “dragon bones” throughout time, acrossTaiwan, and throughout Asia? One thing is for certain: the dragon is an important mythical cultural symbol throughoutAsia, and their real counterparts – dinosaurs – will be a key feature in THL’s 2012 book catalog. 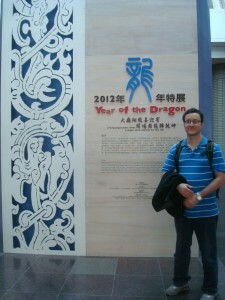 This year, THL will celebrate the Year of Dragon by releasing a minimum of 3 books focused on paleontology; and will be building a major presence in Asia, the original home of the Dragon. If you happen to be in Taipei currently or in the near future, please visit THL’s booth at the Taipei International Book Expo from Feb 1-6, 2012, at the Taiwan World Trade Center (details on our events page), or visit our new Taipei office at ZhongXiao DongLu (please set up an appointment via our contact page). With the upcoming THL release of Penny Noyce’s “The Desperate Case of the Diamond Chip,” we’ve been hearing questions from people who wonder if diamond semiconductors are just science fiction or a metaphor of some kind. Well, while our Galactic Academy of Science series is centered around the concept of time travel, which is indeed science fiction (at least for now), the underlying diamond chip mystery is founded in real modern science. In the “Diamond Chip” book, students go back in time to learn about the origins of modern semiconductor science, studying chemistry, physics, some basic electronics, through to the creation of the Si chip (by Penny Noyce’s father, Robert Noyce, founder of Fairchild Semi and Intel) and onward through modern cutting edge materials science. In their journey, they learn about the various creative thinking methods used by famous scientists from the past, to uncover important knowledge, building on prior knowledge, to create the modern microchip. Microchips are the central component in most of the technology devices people are familiar with today – from computers to microwave ovens to cellphones to cars. It seems that these gadgets get faster and better all the time. This concept, that chips become faster in speed and performance, and smaller in profile, is known as “Moore’s Law”. Gordon Moore, along with Penny’s father Robert Noyce, were among a handful of original engineers who took Robert’s Silicon chip and through Intel, helped to create Silicon Valley and ultimately created one of the largest global industries today. Moore’s law stated that the number of transistors (the parts of the chip that make things happen) on a chip will double about every 2 years, thus making chips smaller, and progressively more powerful, at a faster and faster pace as time goes on. Well, Moore’s Law, which was first stated in 1965, has largely held true, for the most part over many decades. But in recent years, many scientists have begun to believe that Moore’s Law has hit a wall or may potentially need to be revised. A number of scientists claim that the physical limitations of materials and perhaps even physics itself is being reached. One of the biggest problems facing chips, and many other electronic products, is heat buildup. As chips become hotter, computers or other devices which house the chips become hotter, and performance is degraded dramatically. Heat causes chips to fail or perform incredibly slowly. Outside of the difficulties in making smaller transistors, and finding new materials to protect the small circuits, heat has been a major factor in semiconductor industry changes in recent years. Silicon, which is still after so many years the basis of all modern chips (or in some cases Gallium Arsenide or other exotic materials), has an inherent inability to remove heat. Companies across the world are looking for alternatives to Silicon, for the future product roadmaps. There are a number of materials now being explored, but one thing is certain, and has been known for many decades – diamond is not only durable and brilliant, but is one of the best materials in the world for thermal conductivity. 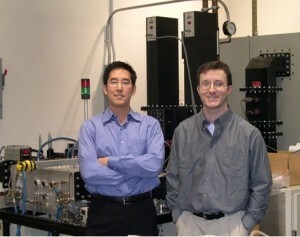 Work is currently being done by various companies on carbon based materials related to diamond such as “graphene” (which is quite similar to diamond in many ways) and other advanced materials as substrates, as well as materials on the inside of the chip, including “low K” materials (which act as insulators in the chip, protecting electrons from flying away into the Silicon and producing more heat and wasted electricity), among other things. As this work is proceeding, companies are working in other areas to do their best to extend Moore’s Law; for instance, most companies are expanding the size of wafers more and more to make the production process more efficient, as transistor sizes become smaller and more densely packed together. The industry is currently capable of making “features” or parts of the chip, like little transistors, under 20nm in size. As a matter of fact, in a number of labs throughout the world these features can go even smaller (thousands of times smaller than Robert Noyce worked on, almost at the atomic level). Many companies are also working to make chip architecture more efficiency by stacking chips together, or making “3D chips” – these are already in production and are expected to be a major source of industry growth in coming years; they extend Robert Noyce’s 2D ideas (which were not only novel at the time, but have kept the semiconductor industry going for half a century, and are still the same basic processing blueprints for how to make a 3D chip). One possible next step in the future, to make chips both high speed and cooler at the same time, is doped synthetic diamond. Diamond is considered quite possibly the “holy grail” of semiconductors; in fact there are now a number of companies out there looking into what is known as SOD (semiconductors on diamonds), although there are still a number of technical hurdles to overcome in order to make the concept commercially feasible. Diamonds, for at least the past decade, have been in use in the production of most semiconductors, as an abrasive on the surface of giant pads, which polish Silicon wafers (in a process called CMP: chemical mechanical planarization). Diamond was at one point extremely expensive (and natural diamonds from deep under the ground continue to be expensive), but in its synthetic form has become progressively cheaper and cheaper since the 1950′s when diamond synthesis first became possible. Because of its superlative physical properties, diamond is already used in many laser applications, defense, aerospace, medical equipment and even consumer applications like LEDs (LED means Light Emitting Diode, which is basically a piece of semiconductor-like electronics that replaces light bulbs, making them brighter or last much longer without replacing – even up to 30 years; examples of LEDs are traffic signals / crossing signals, flat panel TVs and various types of car lights), nail polish (to make the polish last longer, without chipping), high end speakers (to make the high end sounds of tweeters more crisp, so you feel like you’re listening to a real symphony instead of a recording) and golf clubs (to make the golf balls go much further than just metal golf clubs) – to name a few. Very tiny diamonds, nanodiamonds (10^-9 m in size) are now being considered for use in pharmaceutical drug delivery (so people who are sick can take medicine one time and it can last a long time instead of taking many pills every day, which they might sometimes forget) and even cosmetics (so the cosmetics last longer, keep their color, don’t smudge, and have more brilliance), among many other things. Some of these diamond applications are based on thermal properties (diamond has the highest thermal conductivity in the world, because it is a very solid crystal which can transmit heat through waves, and not just particles), some for optical properties (diamond is the most clear, optically pure material in the world), some for hardness (diamond is the hardest material in the world, so it’s scratch proof), and also healthcare because diamond is made up entirely of carbon, and as such is completely compatible with human bodies, which are all carbon-based. One of the big problems facing new exotic materials is that they are often hard to produce in large sizes at a low cost; while there are many commercial tradeoffs between advanced materials such as graphene and diamond, researchers are at this very moment pursuing both options fiercely to advance technology, and will undoubtedly uncover many new and unexpected findings along the way. While we do not know for certain whether or not there will be graphene chips, diamond chips or another type of carbon or non-carbon-based chip in the future, perhaps in the coming decades, we are certain that it is possible. It is the possibility that is exciting – especially the possibility that perhaps children reading books from THL’s G.A.S. series, might become inspired to one day be the inventors of the enabling technology that allows these materials to be used. That is our hope. 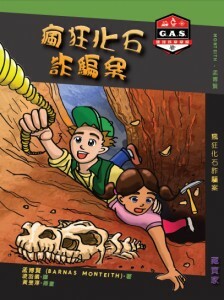 The Desperate Case of the Diamond Chip debuts at the Taipei International Book Expo on Feb 1-6, 2012, at the Taiwan World Trade Center, with galleys / advanced reader copies available in both traditional character Mandarin Chinese, and English.